To bid adieu to a beloved monarch, the sombre ritual to build a funerary pyre called on the best artistic skills in the land. Thai hearts ached when the dreaded countdown began for the royal cremation ceremony of Thailand’s much-revered monarch, HIs Majesty the late King Bhumibol Adulyadej. While the heavy cloak of grief covered the country since the day the ‘father of the nation’ passed away, preparations were already underway for a historic and remarkable ceremony scheduled for five days between October 25-29, 2017. 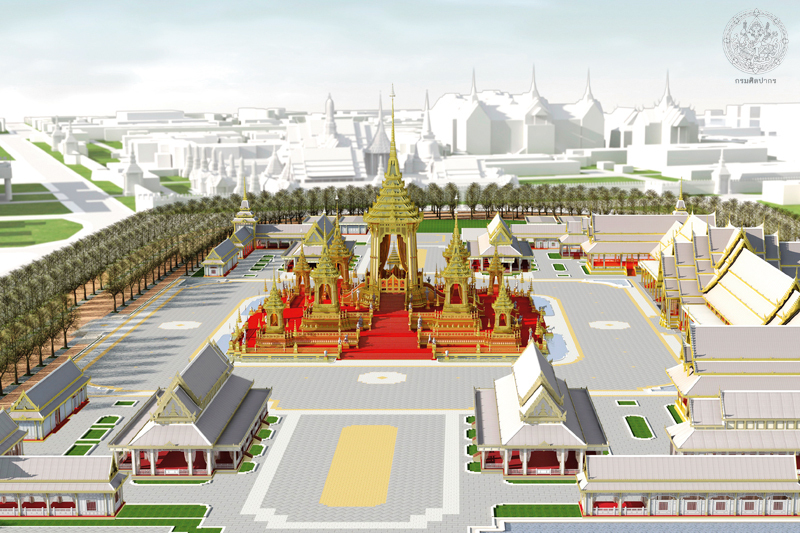 The royal crematorium, called the Phra Merumas, was the key component in the cremation ceremony where most of the traditional rituals were performed. The construction of the specialised funeral pyre reserved for royalty came under the responsibility of the Fine Arts Department, of the Ministry of Culture. The grounds of Sanam Luang, the vast green field north of the Grand Palace served as the site for major preparations – including where Phra Merumas was built. Other intricate artwork meanwhile, was prepared at the Office of Traditional Arts on Buddhamonthon sai 5, Nakhon Pathom and also at a few renowned art colleges. The Phra Merumas is a temporary pyre structure, using steel frames that are easy and quick to assemble. 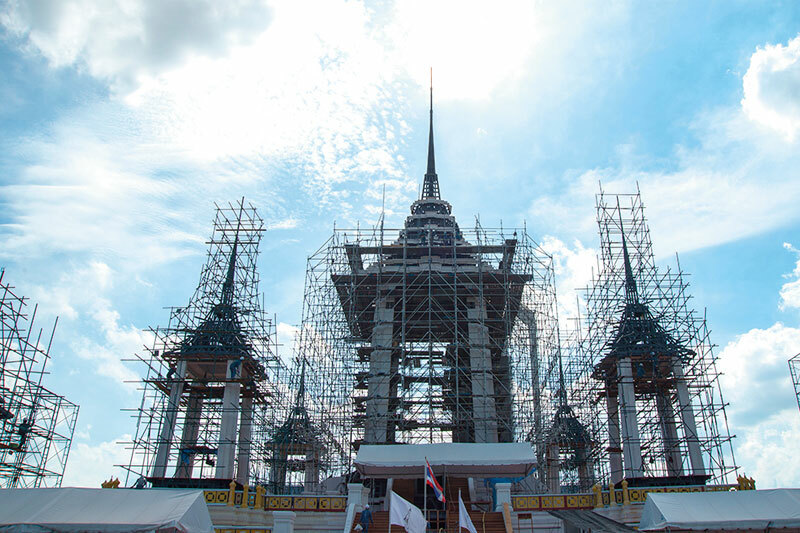 After the cremation ceremony is completed, the structure will be demolished and not retained for future royal cremations. According to Thai tradition, funerals are not prepared in advance. Even though the Phra Merumas will be used only once, the craftsmanship that has gone into every part of it is of the highest level. Therefore the Phra Merumas for His Majesty King Bhumibol Adulyadej resulted in a majestic farewell unprecedented in scale and historical gravity. Initially many designs of the Phra Merumas were presented to HRH Princess Maha Chakri Sirindhorn, the daughter of the late King, who made the final selection. 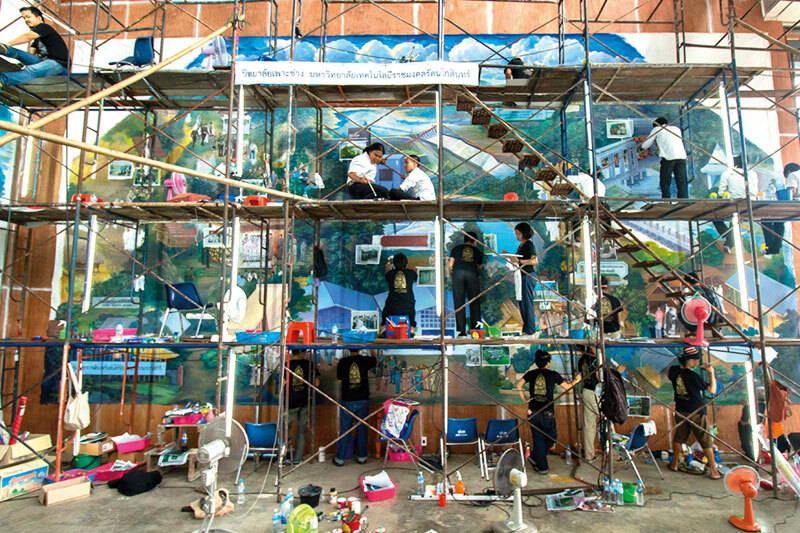 From there, Mr. Kokiart Thongphud, an artist of the Fine Arts Department, created the chosen design. The Phra Merumas for King Bhumibol stood at 50.49 metres tall and 60 metres wide. Unlike other royal crematoriums previously constructed, it consisted of nine busabok – a tall structure placed on a four-tiered square – shaped base, each independent from one another. Of the nine busabok, the principal one stands on the top and at the centre of the entire structure, surrounded by a smaller busabok on lower layers. The design concept came from royal tradition and Buddhist literature (known as) Traiphum. The main busabok is compared to Mount Meru, believed to be the centre of the universe where sacred deities reside. Other smaller busabok surrounding the main one are compared to Sattaboriphan Khiri, the subsidiary peaks around Mount Meru. At the foot of Mount Meru lays the Himaphan Forest, which is inhabited by mythical animals and Anodard Pond, believed to be an origin of five sacred rivers. According to the Brahman doctrine, a king is an avatar of the three mighty gods – Brahma, Shiva and Vishnu. As the word “Ramathibodi” appears in his full name, King Bhumibol is upheld as an avatar of Vishnu or Narayana. Also based from Buddhist belief, he is a Bodhisattva born in the Dusit level of heaven, who will reincarnate as the future Buddha. In other words, the Phra Merumas was built to send the monarch back to the Dusit level of heaven and every component of it is centred on these beliefs. The design of Garuda, for example, appeared in many components of the Phra Merumas structure since Garuda is Vishnu’s carrier to the heavens. From dawn to dusk, hundreds of artisans and public volunteers gathered on sits at Sanam Luang and the Office of Traditional Arts and sped up their work in moulding the sculpture, paintings, wood carvings and ornamentation. All were proud to play their part, big or small, in this work dedicated for a beloved King. In addition to superb craftmanship, the work is unprecedented in its unique representation for King Bhumibol and features symbolic designs and a distinctive style of art developed during his reign. Exceptional paintings were seen on the Chaak Bang Phloeng, a foldable panel placed at the top of the stairs that climbed up to the royal funeral pyre to spare mourners from the sight of the cremated body. Also, more unique paintings were displayed on the three walls of Phra Thinang Songtham, a royal pavilion for His Majesty the King, members of the Royal Family and top officials. Monthian Chusuahueng, an expert artist from the Office of Traditional Arts, is responsible for the paintings design and said that his concept was to make the monarch’s presence felt in every piece of work. 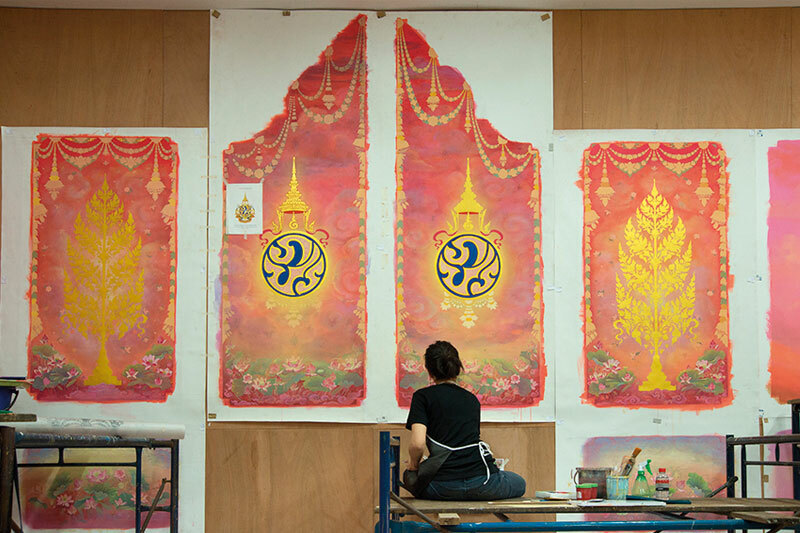 Apart from the traditional design of heavenly flowers together with eight avatars of Vishnu representing King Bhumibol, the paintings also depict the monarch’s work and contributions for his people. The lower part of Chaak Bang Phloeng panels featured the royal initiatives in four categories – soil, water, wind and fire (or fuel). They feature royal-rainmaking, the Chaipattana Aerator, the wind turbine, the solar cell and biodiesel projects. Meanwhile, the paintings on the walls of Phra Thinang Songtham also depict a bird’s eye views of 47 royal-initiated projects from all regions of the country. “Our paintings portray past events when the late King travelled around, visiting people in royal-initiated projects. We try to keep every detail of each project or event, including the architecture, colours of each component, clothing, and appearance of people in the scenes. This kind of painting has never appeared in any royal crematoriums of the past,” said Mr. Monthian.